Corey Pearson was red-carded late in the game at Kello (library pic). Kilsyth Rangers battled in the mud to earn a point from a 3-3 draw at Kello Rovers on Saturday. The Super League First Division clash produced six goals, a red card and controversial decisions, but an entertaining game nevertheless and probably a fair result in the end. Rangers started well and with 25 minutes gone Stuart Livingstone struck a fine low shot into the corner of the net to put Rangers ahead. Another goal looked almost inevitable in view of all the visitors’ pressure, but when it did come it was at the other end with F Bell heading in from a corner. Rangers claimed a penalty when Franny Kelly went down in the box but the referee was having none of it and the teams went in level. After the break Kello were much more in the game and it was no real surprise when Wilson slotted home a good low shot from just outside the penalty area. Rangers were struggling to regain the advantage. But they made a couple of changes up front with Marc Duffy and Ian Diack replacing Jamie Watson and Kelly and the move paid off when Duffy bundled the ball into the net from close in. The lead didn’t last. From the restart Kello punted the ball upfield and substitute Shaw ran on restore Kello’s lead within less than 10 seconds gone. Rangers had another penalty claim turned down, but from the corner Scott Davidson scrambled home an equaliser despite Kello claims his shot hadn’t crossed the line. 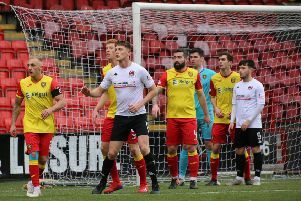 The last few minutes became rather competitive and Corey Pearson saw a red card after a rather rash and needless challenge.